The famed Newport, Rhode Island, Gilded Age mansions, The Breakers, The Elms and Marble House, welcome visitors for Christmas from November 23 through January 1, 2014. The Preservation Society of Newport County is presenting music, tours, shopping events, and visits from Santa Claus at three of America’s grandest historic houses. New this year is a gingerbread house competition at The Breakers. Four local pastry programs have created gingerbread models of the Newport Mansions that are on display in the kitchen. The competitors are Clements’ Marketplace in Portsmouth, RI; Diman Regional Vocational Technical High School of Fall River, MA; Fatulli’s Gourmet Bakery in Middletown, RI; and Russell Morin Fine Catering of Newport and Providence, RI. Returning to the Great Hall of The Breakers this year is the 15-foot tall poinsettia tree, which for the past few years had been displayed at The Elms. The “tree” is made up of 150 individual poinsettia plants, grown in the Preservation Society’s own greenhouses. The plants are removed and replaced several times during the six-week holiday season to ensure the display remains fresh. Christmas trees of various sizes throughout the houses are adorned with new flickering LED candle lights. Additional decorations in the three houses include dozens of wreaths, hundreds of yards of garland and thousands of flowers, including poinsettia plants, lilies, roses, carnations and potted palms. Ornaments reflect the colors and décor of individual rooms, and white candles illuminate the windows. Additional highlights include an eight-foot decorated wreath on the grand staircase of Marble House, new large evergreen kissing balls hung in each house, and a pastel floral theme in the ballroom of The Elms. Christmas officially arrives at the Newport Mansions on Saturday, November 23. The Breakers, The Elms and Marble House will be fully decorated and open daily for tours, except Thanksgiving and Christmas Day, through January 1, 2014. A Winter Passport ticket providing daytime admission to all three houses can be purchased for $28 for adults, $9 for children 6-17. Children under the age of 6 are admitted free. Individual house tickets are also available. Tickets can be purchased online at www.NewportMansions.org, or at each property. Holiday Evenings at the Newport Mansions provide a unique opportunity to see these historic houses lit up for a night-time celebration. Guests can take a leisurely self-guided tour through the museum, enjoying live holiday music and a stop for cookies and pastries, eggnog and cider. Holiday Evenings at The Breakers are scheduled for November 30 and December 7, 14, and 28, from 6 p.m. to 8 p.m. On December 21, guests can enjoy a Holiday Evening Duet: The Elms and Marble House, and see both of the houses for the price of one, from 6 p.m. to 9 p.m. Admission to Holiday Evenings is $28 in advance, $35 at the door. Children 6-17 are admitted for $10. Children under the age of 6 are admitted free. Preservation Society members enjoy reduced admission, $25 in advance, $30 at the door. On December 21, a single ticket provides admission to both The Elms and Marble House, as well as shuttle service operating between the two houses. More information, including the schedule of Holiday Evening entertainment, and advance tickets are available online at www.NewportMansions.org, or call (401) 847-1000. Children can visit with Santa Claus in a spectacular setting at each of the three mansions on Sundays in December. Santa will make public appearances from noon to 3 p.m. at The Breakers on December 8, Marble House on December 15, and The Elms on December 22. The visit with Santa is included in the regular admission price. The Breakers, a 70-room Italian Renaissance-style palazzo, was designed by architect Richard Morris Hunt and completed in 1895 for Cornelius Vanderbilt II, President and Chairman of the New York Central Railroad. Its interiors include rich marbles and gilded rooms, a 50-foot high Great Hall, mosaic tile floors and ceilings, and open-air terraces with magnificent ocean views. The Elms is an elegant French-style chateau built in 1901 for Philadelphia coal magnate Edward J. Berwind. It serves as a backdrop for monumental artworks, including wall-sized 18th century Venetian paintings and Chinese lacquer panels. The Elms is situated on a 10-acre park with an elaborate sunken garden. 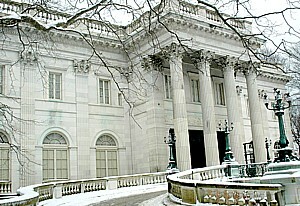 Marble House was the summer home of Mr. and Mrs. William K. Vanderbilt. Built and furnished at a reported cost of $11 million, it was the most lavish house in America when it opened in 1892. It became a grand stage for Alva Vanderbilt’s climb to social and political power, first as a leading society hostess and later as a leader of the “Votes for Women” campaign. The Preservation Society of Newport County, Rhode Island is a non-profit organization accredited by the American Alliance of Museums and dedicated to preserving and interpreting the area’s historic architecture, landscapes and decorative arts. Its 11 historic properties—seven of them National Historic Landmarks—span more than 250 years of American architectural and social development. For further information, visit www.NewportMansions.org.